1. Think of yourself as a marketer – a job candidate is your consumer. 2. Be transparent. Is there anything about your company that someone may not like? Put this turn-off in the job description. Show job seekers the pros and cons of the job right up front. 3. State the total benefits package. Include travel requirements, dress code, PTO, and career advancement opportunities. Doing so will attract the right employees to apply while screening out those that may not fit. 4. Don’t exaggerate your company culture. What is unique about your company? What are your employees getting out if it? Your company has a ping pong table, but what skills are they learning? 1. Make it look neat. 2. Break up paragraphs and keep them concise. 3. Use bullet points to make it easily scan-able. 4. Check spelling and grammar, of course. 1. Don't keep your posting up until it's filled. Applicants applying late in the game don't have a chance of being considered. Investigate how many applicants it takes to find the right fit for the job. If it only takes 30, you don't need to deal with 300. 2. Use different job branding tactics for different jobs. For high profile jobs, you'll be doing the hunting. 3. If you have a job that you're frequently recruiting for, such as an entry-level job, your goal is to increase the quality of candidates, not the quantity. Change your initial screening questions to help refocus recruiters' attention on applicants that are the right fit. 4. For high-flow entry-level jobs, take down the job posting sooner to shut off the application flow and to increase recruiter productivity. 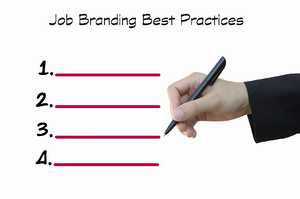 Job branding is just one of the hot topics for 2015. To learn more about recruting trends, download our free whitepaper, "Trends in Recruiting: 2015"